Voice Over sampler with 3 examples of a standard American accent. Voice Over commercial for travel with a standard American accent. Voice Over sampler with a short script for animation with various character voices. Voice Over sampler with a short script for animation of a Mother/Daughter. Voice Over sampler with a short script from a Dr Who online episode – Untula – New Yorker accent. Voice Over sampler with a short samples for the games market. This is a sample for corporate voice over from Kimberly Clark. This is a sample for corporate voice over. This is a short sample of phone instructions. This is a short intro. to a longer educational program. This is a short excerpt from a longer narrative piece on Eva Peron. Example of Debbie reading Entertainment news. Listen to it by clicking here! Can’t view the playlist above? Click here to watch on YouTube. This has short excerpts from some of the shows. This has short excerpts from newly composed pieces which are mixed with well known pieces, but in a wide range of styles. This has short excerpts from some of the operas. While producing some radio shows. 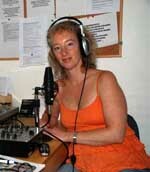 Radio was an adventure for Debbie, which started with a call from Radio Reverb (97.2 FM), a community-based Radio station in Brighton, who were looking for new and interesting programs to help launch their radio station onto FM and on the internet. Debbie submitted “The New Classics” , a show devoted to current UK writers of contemporary classical music. This show is no longer running, but there are plans to create a new radio show for another community-based radio station, based around Debbie’s Talks about American Composers, so watch this space to see some samples in the near future. Wanting to do something more community based, Debbie also created “Debbie’s Mixed Bag – Fine Arts and Fine People of Brighton and Hove.” Aired once a week on Sean Creed’s show, bRighToN pHlUx, these are 10 minutes slots where Debbie interviewed various artists, charities and not for profit businesses about their work in and around the community. Interview with Alix Dryden, artist. With Laura Escott, Chairperson for Survivors Network, a registered charity to meet the needs of women who are sexually abused and are now facing the long-term consequences. If you wish to see video’s of Debbie’s Acting, click here. If you wish to see and hear more of Debbie’s singing, click here.